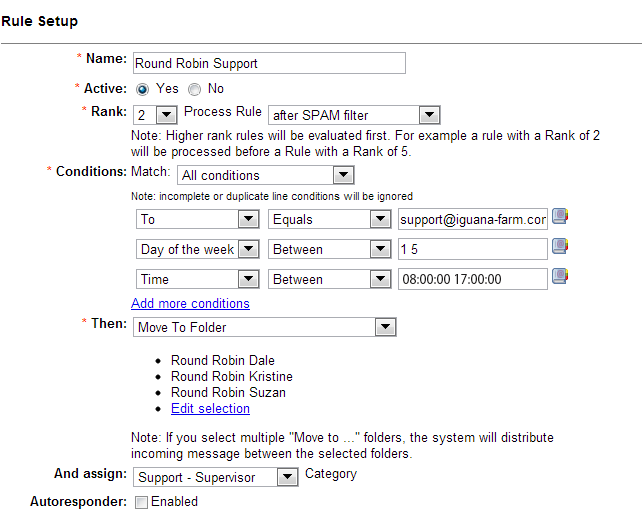 Besides manually assigning emails to multiple users, ReplyManager’s "Round Robin" Rule can be created to automatically, evenly distribute incoming emails to multiple folders. This is a very flexible way to "include" a specific set of users or to "exclude" a particular user that may be absent for the day. Set up the conditions (keywords) so the system can route email into specific folders or evenly distribute email into multiple user folders (round robin style). Once an email has been assigned, whether manually or automatically, the system notes will then track any action taken on the email such as open, close, reply, move to another folder, or adding a note. Any additional messages will be attached to that email thread, so in effect, the User has taken responsibility for the email and all follow ups from the customer. Note: Additional conditions can be set on a rule, including time and day of the week, for very specific instructions on when to apply this rule. These conditions are for Monday through Friday (1 5), between the hours of 8am and 5pm (08:00:00 17:00:00).